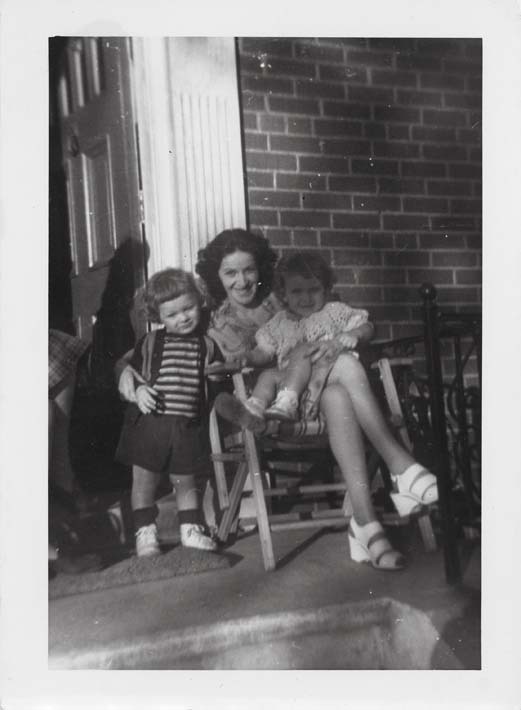 This is a black and white photo of Antoinette (Toni) Ciccarelli sitting on a porch with two children. She is sitting on a wooden chair with a plaid coloured cushioned seat. She smiles straight into the camera and holds a child on her lap. Her right arm is embracing the second child who stands beside her. Toni is wearing a patterned dress with white strappy wedge sandals. The child, a girl, on her lap smiles into the camera and is wearing a light coloured crochet-type top with light coloured lace-up running shoes. The other child, possibly a boy, is wearing a striped top under a striped sweater with dark coloured shorts. He is wearing dark coloured socks with a pair of light coloured lace-up running shoes. To the left, a lady's legs is shown slightly cut off camera. The lady is wearing a dark coloured plaid skirt or dress and dark coloured lace up shoes. The background is of a brick house with a dark coloured door accented by a white frame.